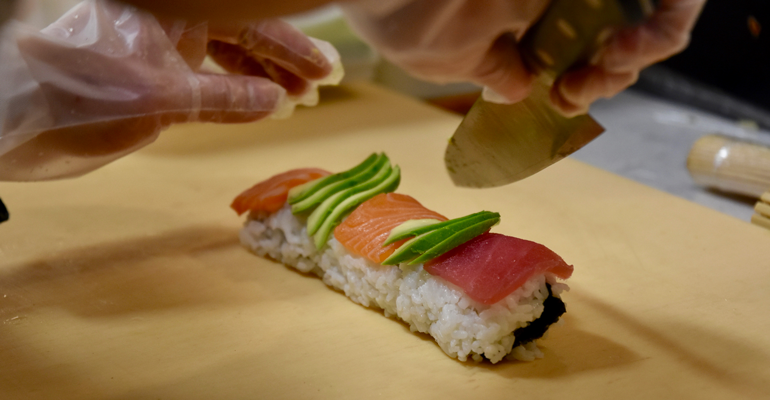 Every day, students at the Quinnipiac University main campus order a thousand sushi rolls. Sushi was at the top of the wish list for on-campus dining options when Chartwells surveyed students at the Connecticut university in an effort to gather data about their campus dining experiences and requests for improvements. Chartwells has been Quinnipiac University’s dining vendor for 32 years. Since then, the company has seen a huge increase in the dining program. That’s because the school has made efforts to expand over the past decade. The student population has boomed, from 4,000 to 10,000 students. To accommodate, Quinnipiac has expanded from one campus to three. Leean Spalding, director of dining services, says the university serves 13,500 meals daily across all three campuses, operating under a declining balance model. At Café Q, in the main dining hall on the central campus, they run about 9,000 transactions per day. There are 6,900 undergraduate students at the university. They also serve a portion of the staff, faculty and students who live off campus. The main dining hall is predictably overcrowded. To help alleviate long lines, Chartwells conducted focus groups to determine what kind of food students would welcome most. They hoped that creating a new, popular option would draw students away from the main dining hall for a portion of their weekly meals. Those roundtable discussions took place with eight groups, including commuters, athletes, residents and members of student government. Sushi was the clear winner in the food category. In response, Chartwells created Revolution Noodle and Sushi, a concept now located one floor above the main dining hall. The university partners with a vendor that has held sushi pop-ups on campus before, a local outfit that also serves Yankee Stadium. The One Sushi, run by Jack Woo, has full control over the sushi menu, preparation and service. Chartwells is in charge of the other part of the concept, a pho station where students build their own noodle bowls. A team of four sushi chefs created a fixed menu of sushi rolls and sashimi and runs the station. They also offer specials. 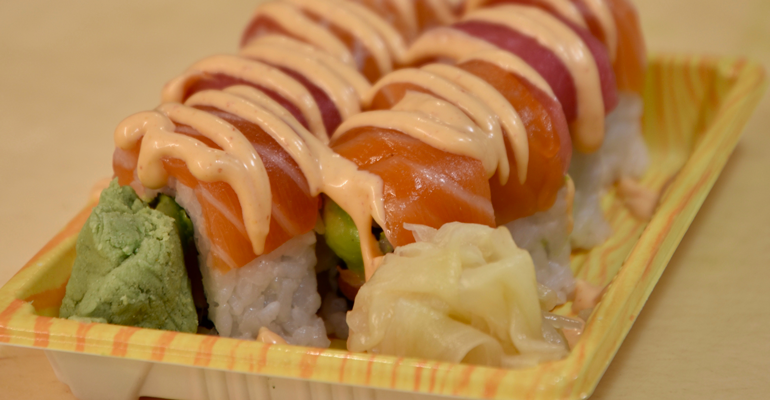 Popular items include California, spicy tuna and spicy salmon rolls. After the concept went live, they added more vegetarian options in response to student requests, including a veggie roll and a popular sweet potato roll. At the noodle station, students choose chicken, ramen or vegan Thai broth with udon, rice or lo mein noodles and chicken, shrimp or crispy tofu. They can choose from a variety of toppings such as baby corn, Napa cabbage, carrots, chopped ginger, eggs, fried shallots, water chestnuts, lime wedges and cilantro. Chartwells works with vendors that automatically source local produce whenever it’s available, Spalding says. The One Sushi focuses on sustainability, sourcing some fish from the New York area, says Chuck Couture, resident district manager. The noodle station requires two dining employees who assemble bowls at the station, plus an additional prep chef in the back. Revolution is open for lunch and dinner, Monday through Friday. Quinnipiac Dining employs 225 workers overall who run three full-service cafeterias, a satellite location, a full-service restaurant that operates during hockey games and a new on-campus Starbucks. (Student feedback in the same survey listed coffee from a national chain as their top pick for a new beverage option on campus.) They also run a catering operation. The Revolution concept hasn’t solved all of the over-crowding challenges—they acknowledge that it’s only part of the solution—but it’s been a “wildly popular” addition, according to Couture, and is a point of pride among students. When they opened the concept for the first time, the word got out on Twitter. “Within 20 minutes we had 80 people in line,” Couture laughs. “It wasn’t much of a soft opening.” They ended up closing early because they ran out of food.